Blueberry Baked Oatmeal - Perfect for Breakfast OR Dessert! Blueberry baked oatmeal is a great option for a vegan breakfast. This baked oats version of overnight oats is loaded with blueberries and baked with Oat Yeah™ oatmilk. 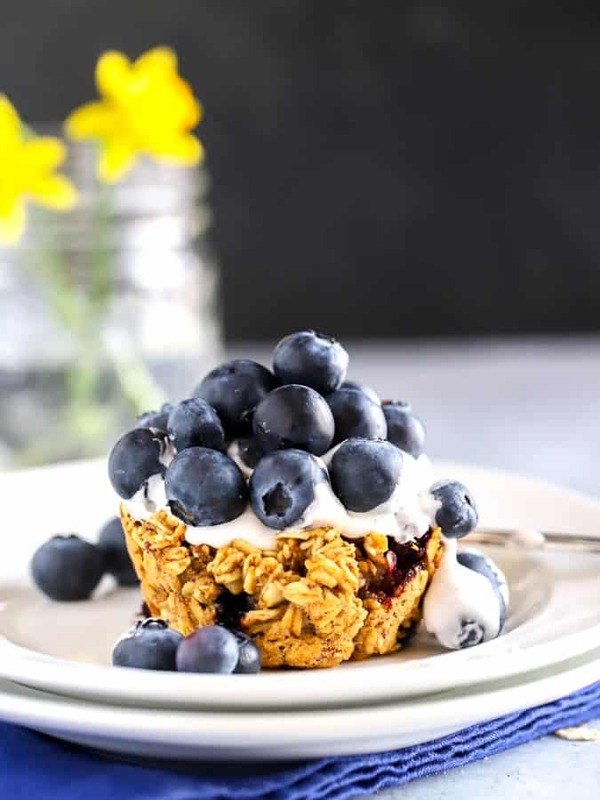 Top with So Delicious® Cocowhip™ whipped topping and fresh blueberries to transform these baked oatmeal cups into dessert! We all know that eating breakfast is a good way to start your day but when you are caught up in the daily morning scramble to get your kids ready for school and then on to work, breakfast can feel like a challenge. Overnight oats are a popular breakfast idea right now but the texture doesn’t appeal to my son. Here’s a solution: baked blueberry oatmeal! 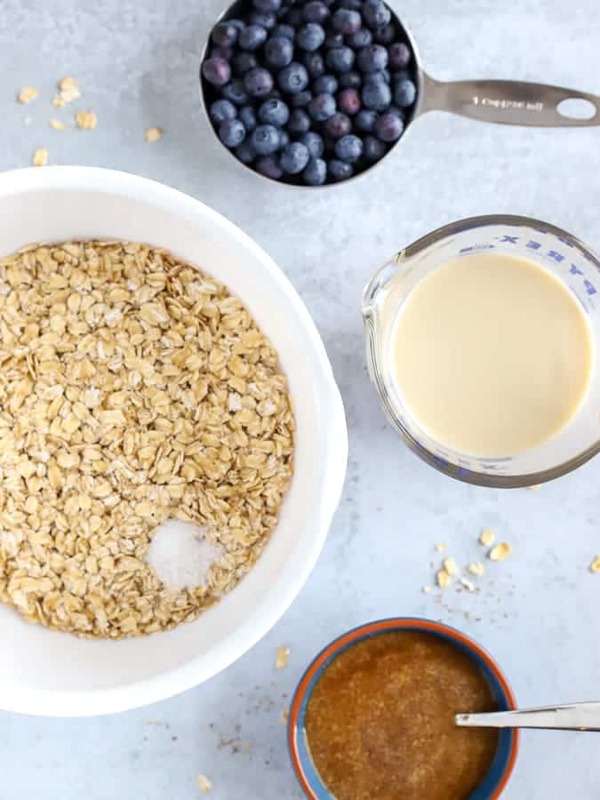 This baked oatmeal recipe takes the ingredients in overnight oats and bakes them into oatmeal cups that kids (and parents) love! This breakfast is as close as can I get to eating oatmeal cookies for breakfast. Hooray! My sweet tooth rejoices! You can make this oatmeal breakfast bake the night before or whip the ingredients together in the morning. My favorite option is baking the oatmeal cups in a large batch and freezing them. Then you can defrost the individual servings overnight and reheat in the oven. Serving a crowd? This baked oats recipe does well in muffin cups or in an 8 by 8 pan. Simply slice into baked oatmeal bars and serve. Oh, did you say you wished that making a vegan dessert could be so easy too? No problem! With a simple dollop of Cocowhip™ and a topping of fresh blueberries, this breakfast is suddenly a company-worthy dessert! 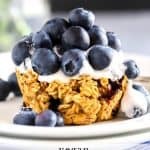 What ingredients are in Blueberry Baked Oatmeal? A quick note about flax: The ground flaxseed and a small bit of water combine to make what is called a “flax egg”. In vegan baking we don’t use any animal products so, of course, that means no eggs. A flax seed egg replacer helps to bind the ingredients together in this oatmeal recipe. You simple stir the ground flaxseed and water together, let them sit for 5 minutes, then add to the recipe. Silk® Oat Yeah™ is a dairy-free alternative to milk that comes in three options: plain, vanilla, and chocolate. 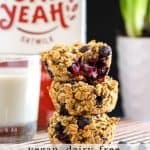 Oatmilk is a creamy, dairy-free, nut-free, soy-free beverage that you can use just like milk for everything from drinking straight from the glass to pouring over cereal to baking. 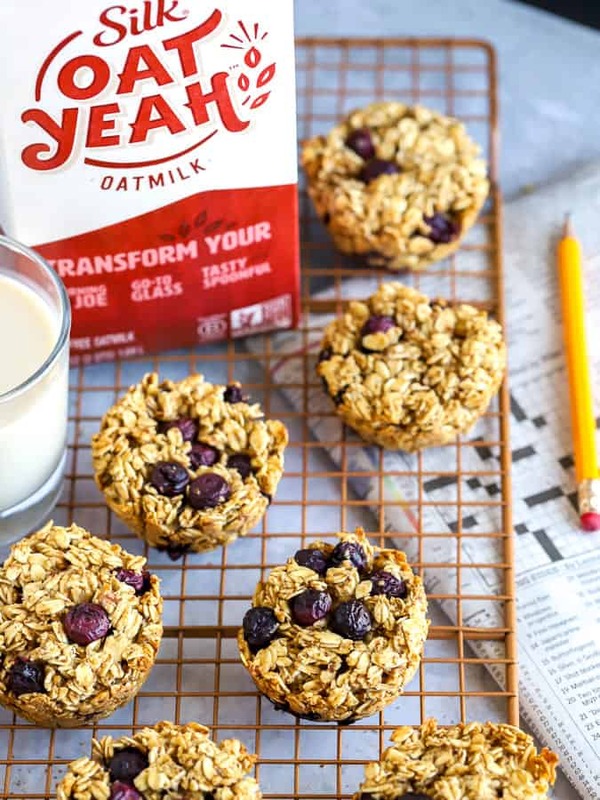 Oat Yeah™ is part of Silk’s portfolio of beverages including almondmilk, soymilk, cashewmilk, and coconutmilk. Nearly endless choices! Which is your favorite? All are dairy-free and are made with ingredients that are sourced responsibly. Silk takes pride helping people make progress towards living their best life. For me that means eating a plant based diet for some of my meals. 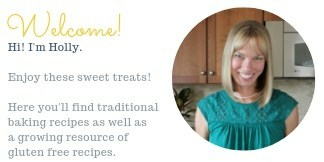 Baking with oatmilk is a positive step for me and as Silk says, Progress IS Perfection! 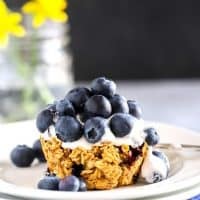 If starting my day with these lovely, blueberry filled oatmeal cups is my road to perfection than count me in! 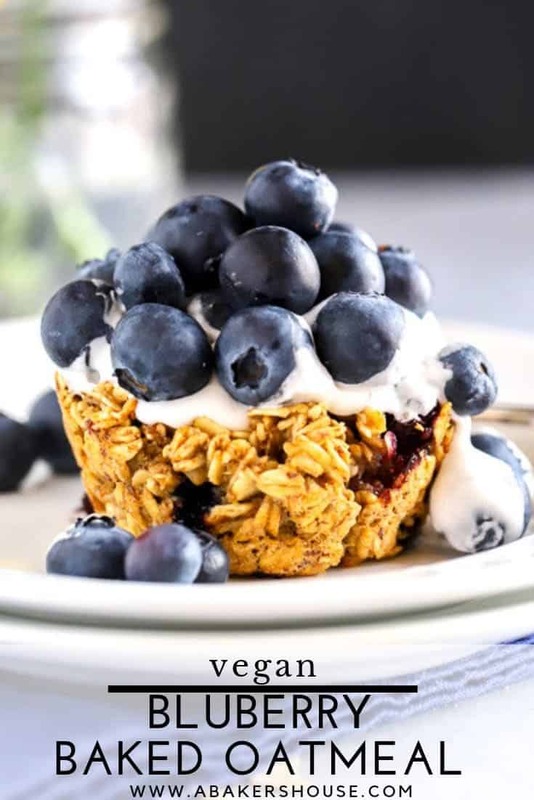 Is this blueberry baked oatmeal vegan, dairy-free, and gluten free? Dairy-free: Yes, all ingredients listed are free of dairy. Gluten-free: Pay close attention to your oats and buy gluten free oats. 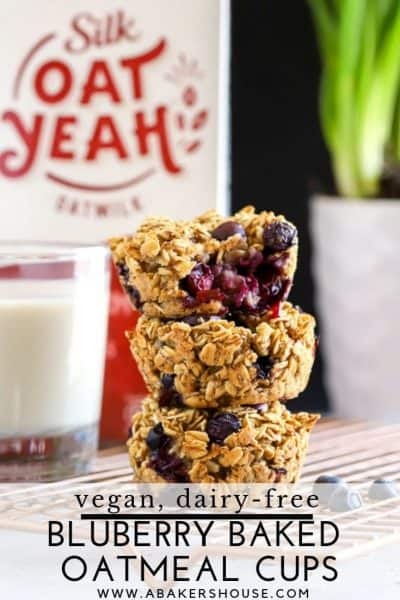 Oat Yeah™ is made with ingredients that are naturally gluten free but because there is a small risk of cross-contamination with other gluten-containing ingredients the oatmilk is not certified gluten free. If you require a certified gluten free recipe, simply use Silk Original Almondmilk in place of Oat Yeah™. Plant based foods taste great…and at 35% off they taste even better!! Sprouts Farmers Market 35% Plant Based Taste Great Sale is going on March 27th – April 3rd, 2019. Head over to your local store to find these products from Silk. Load your cart with produce and feel good about your food choices. Pin with me! Breakfast or Dessert? BOTH! 1. Make a flax egg: combine 1 tbsp. ground flaxseed and 2 tbsp water. Stir and let sit for 5 minutes. 2. In a large bowl gently combine the 3 cups old fashioned rolled oats and ¼ tsp salt. 3. In a large measuring cup combine 1 cup Oat Yeah™, ¼ cup maple syrup, and 1 tsp vanilla. Add in the flax egg. Pour the liquids onto the oats and fold to combine. Let sit for 10 minutes or until the liquid is absorbed. Fold the blueberries into the oat mixture. 4. Spray a muffin tray with baking spray. 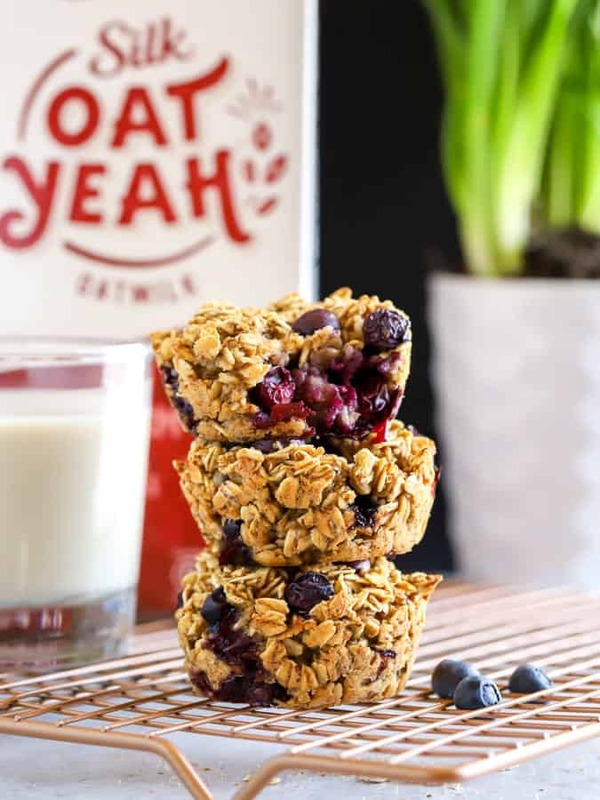 Fill each muffin cup with about ¼ cup oat mixture. 5. Bake at 350 degrees F for 25 – 30 minutes or until golden.